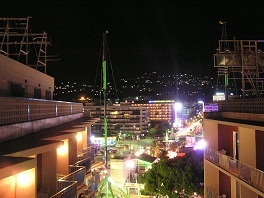 Lloret de Mar is one of the most important towns of the Costa Brava, and a very good starting point for other splendid locations. To get to Lloret de Mar from Santa Cristina you must return to the main road by a route which runs through the middle of a very charming countryside. Traveling there by sea, you can find the La Boadella cove with its llla dels Bots, and the Punta del Cane. The exceptional natural beauty of the scene is boosted by the presence of the mansion of Santa Clotilde, owned by Dr. Raul Roviralta. It is Catalan in style but with Italian influences, and the famous painter Domdnec Carles participated in its decoration and construction. This mansion hosts complete and priceless collections of tapestries, naval miniatures, paintings and Catalan pottery with maritime themes. Its gardens, dropping down towards the sea are very spectacular as well. To the east the beach of Fenals, flanked by tree-crowned rocks, within a wide bay, offers ideal bathing conditions. At the northern end of this bay are the pointed cliffs of Banys and of Fenals followed, at sea-level, by the sharp rock La Caravera. 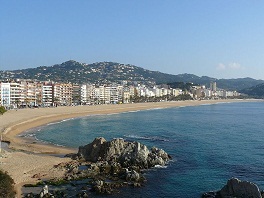 This marks the south-western part of the beach of Lloret de Mar, famous for many reasons. In its long history, going back to prehistoric times, Loret de Mar has been an Iberian settlement, a Greek factory or a Roman fortress. Today it is a very outstanding tourist centre, with its more than 110 hotels, in spite of having a population which hardly passes the 35,000 mark. Though a very crowded tourist centre, it retains the atmosphere of a little fishing village. From Lloret de Mar onwards, the coast becomes more rugged, good roads get increasingly scarcer, and the road, linking with Tossa de Mar is forced to go inland, up into the hills ,a long way from the sea. At sea-level, continuing on from Lloret de Mar beach, you arrive at La Caleta. A track from here ("dels Frares") leads to the Cala de En Trons. If you want to continue on land, you can do so by a simple pathway which winds its way between pine trees leading to Cala Simo and to Cala Grau. Further on, the Punta de la Guaita precedes the beach of Canyelles, Cala Morisca, beach of Santa Maria de Llorell, Punta Boquera and el Llevador.